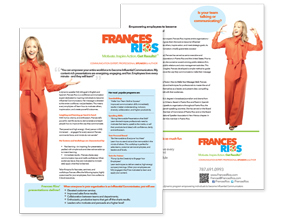 Your speaker one-sheet: Does the content directly support your biz goals? A client emailed a question regarding a new speaker one-sheet we will create together. Her simple question spurred a surprisingly strategic discussion! 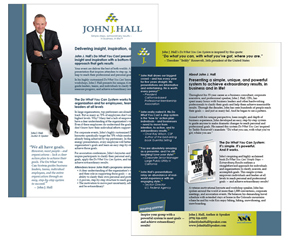 “Presenting just one talk or topic on a speaker one-sheet is perfectly appropriate. In fact, many professional speakers, especially keynoters, have ONLY one talk, and customize as needed for the group. The content on your one-sheet, website, and other marketing tools must align with your business goals. That’s why it’s critical to get clear about your business goals and your brand. This will ensure your on-target content – which should be consistent throughout your marketing toolkit – will help to grow your business in the exact direction you want it to grow. If you own a business, you have to think like a marketing person. Thankfully, this doesn’t mean acting (or dressing) like the stereotypical used-car salesman! Throughout your marketing toolkit – your website, speaker one-sheet/brochure, blog posts, and articles – it’s vital to speak directly to “you” (your client) and emphasize the benefits and results “you” get. Your prospective clients (and audience members) are not focused on you and your company – they are focused on finding the right solution to their problem. Your job is to ensure “what you get” is crystal clear. How can you do this? Simply restructure sentences in your marketing materials. Instead of emphasizing “I” or “we” and the value you deliver, use the word “YOU” and clearly state the benefit (“what you get”). Get your red pen – it’s your turn! Keep your red pen handy! Take a whack at your Home page copy. Is your website’s Home page copy chock-full of “I” or “we”? 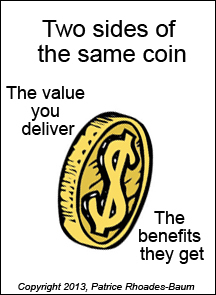 If so, invest a few minutes to restructure value statements into benefit statements. Get in the habit of writing “YOU” to clearly state “what you get”! Your designer gave you 12 logos – you need to pick ONE. Your photographer gave you 50 photos – you need to choose ONE. Your book designer gave you 3 different cover designs – you need to select ONE. How do you choose the best one – the right one? When selecting a graphic of any kind, don’t simply judge it by “like” or “dislike.” If you do, everyone you ask could choose a different image – it’s human nature. Instead, start by clarifying the communication goals. Then select the image that best supports the goals. My good friend Barbara McNichol needed a photo for marketing materials for her “How to Strengthen Everything You Write” Wordshops™. She and the photographer narrowed the shots to 8 finalists. Barbara asked friends to vote on their favorite – nearly everyone chose a different photo! For example, this photo of Barbara says quiet, introverted, and distant. (She is looking away, into the distance.) In addition, the cool, concrete wall doesn’t convey warmth. Finally, I believe the book implies librarian or college professor, not savvy business expert. While this is a very nice picture, it doesn’t fully support the communication goals. In this photo, Barbara’s pose is strong, her gaze is direct, and her facial expression is warm, friendly, and sparkling with personality. Plus, the background is colorful, inviting, and contemporary. This photo says dynamic, confident business expert. Keep in mind, we liked both photos. After spelling out the communication goals, the best photo – the right photo – was easy to choose. Thanks to Barbara McNichol for allowing me to share her experience, www.BarbaraMcNichol.com. Photography by Purple Nickel Studio, www.PurpleNickel.com.